After four long months of Murphy never being so right, so many times, my MarketWaveInc.com website is finally back online. The site has been completely redesigned and retitled, and is now called “Inside Network Marketing“. Besides being much more descriptive of the site’s purpose, it also keeps things consistent considering this is also the title of my book, my podcast, and my new video blog (and was also the title of my fraud and scam exposing radio show on KSCO a few years back, before my spot was ironically given to a show hosted by a call in “psychic”). The new website has been ready to launch for a few days, but it does still need to access some of the functions from the old site, so I was still in need of a reliable, competent, reliable, prompt, reliable SQL developer. But after inviting 13 such listers on eLance to assist me, and having all 13 ignore my offer to give them my money, and after hiring three others who failed to finish the job (two just disappeared) the trait I was most looking for was reliability. I then found a guy on eLance who completely resurrected my old site in less than 48 hours. His name was James Reimer (probably still is). When I saw my MarketWave website come back to life, after seeing it lying there on life support for so many months, I actually teared up a little. That doesn’t happen often. When I used to give out nicknames to the kids on my politically incorrect “Midget League” baseball team they would always give me the same one – Spock. Seriously. I assumed it was due to my name being Leonard and, well, the eyebrows. But when a whole team of Little Leaguers, and two ex-wives, insist it’s because you’re overly-logical and emotionless, I’ve got to go with their version. As you might imagine, a lot of topics have stacked up over the last four months that I really want to talk about. And now, besides hearing me talk about it in a long form podcast, which will be co-hosted by John Fogg, you can also watch me talk about it. Since both M.L.M. IQ Tests (One and Two) have been revised and updated significantly, the “one time” limit has been rescinded for all those who have taken the quizzes previously. Also, the Favorite Company Vote poll is now reopened. The exclusive contact listings for several of the most popular companies have become available, so grab yours quick. Go to the Favorite Company Vote list and just click on your company’s name to see if its available. If you haven’t already done so, please complete the M.L.M. Survey. It’s an extensive survey which has been used to compile responses from over 7,700 participants. To keep the data fresh I reboot the survey every few years and we had left off with just over 400 responses. To see the results of the survey you need only to take the survey. There are some very surprising results so far. The Industry Trends data is now current as well. After reluctantly forbidding any advertising on the MarketWave website for over 22 years, I am now accepting a limited number of banner ads – but only those promoting vendors and other industry service providers. No ads will be accepted for M.L.M. opportunities or products. Please check out the new and improved “Inside Network Marketing” website at InsideNM.com. The original MarketWaveInc.com address still works as well. Thanks for your patience and support during our absence. The Ultimate “MLM Summit”? You Decide! One of my dream projects has always been to hold an “MLM Summit” where not only do many of the best leaders and trainers come together, but all of the most powerful, influential people in our industry. 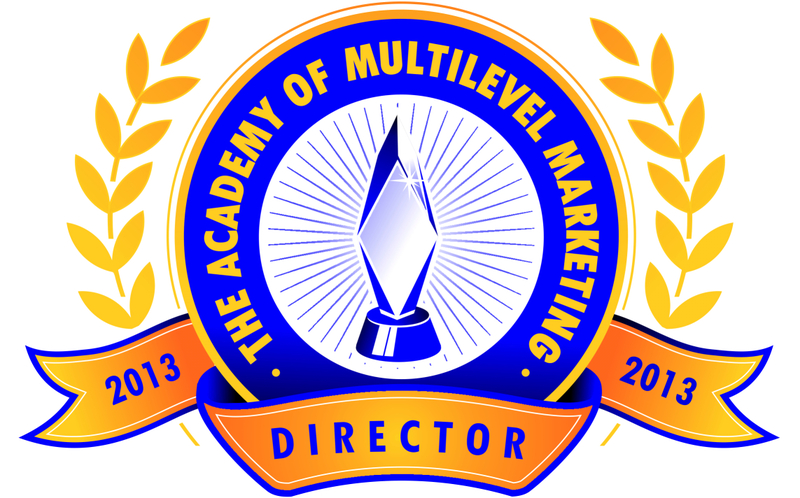 The attorneys, consultants, publishers, authors, watchdogs, vendors, and the executive leadership from our various trade associations and companies, all in one place, for one united purpose – to improve the public image and acceptance of the multilevel marketing profession. This would first involve doing something that so many of our industry’s most influential power brokers (mostly from the corporate, training and publishing segments) have so far been loath to do – admit there’s a serious problem. Nothing is ever going to get fixed until we, as a profession, confess to what’s broke. While the MLM business model itself is just fine, and indeed offers tremendous advantages to any would-be entrepreneur, it is so often dismissed or outright rejected due to mass ignorance of its true nature. This ignorance is perpetuated by the mainstream media, and by a small but prolific clique of anti-MLM zealots. If you want to find them, just Google “MLM”, like many of your prospects are doing. At least five of their sites are usually within the top 25 search results, and typically three or four of the top ten. What has been most frustrating, at least for me, is that their anti-MLM propaganda can be so easily refuted, if not completely debunked, yet so few even make the attempt. The reasoning has always been, “Acknowledging them just draws more attention to them”. That may have made sense, maybe, before about 1996 when that thing called the internet became so popular. Today if we defend ourselves against these anti-MLM ignoramuses perhaps 98% of our prospects are exposed to them instead of 96%. At least, 98% of them that are taking their business serious enough to have done any investigation of it before joining, and have made any attempt to learn more about it once they’ve joined. 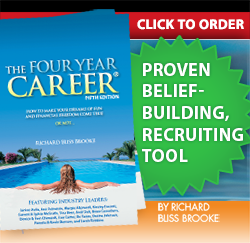 Those that would have the world believe that we’re all just scammers promoting “product based” pyramid schemes are kind of like cavemen with clubs and spears – and we’re the U.S. Marines. But instead of defending ourselves against their onslaught of rocks and pointy sticks with .45 caliber facts and 20 megaton truth bombs, we stand there with our hands clasped behind our backs, with our eyes closed and our chins jutting forward, inviting them to freely batter away. And we could end this tomorrow. Well, maybe not that fast. It might take a couple of months, actually. I know because that’s how much full time work it would take to completely the development of AntiMLMZealots.com. I’ve already produced all of the responses, now I just need to find a web developer with some free time who is as passionate as I am about fighting back, and defending this profession. I’m going to co-brand this site with somebody, and somebody is going to get a ton of exposure. If that might be you, please email me. But, the first thing we need to do is stop giving the anti-MLM Neanderthals a target. There is way too much “junk MLM” out there with gimmicky pay plans and products based on hype, exaggeration, and in some cases outright fraud. Even when the content of our gift has great, legitimate value, way too often the packaging is crap. An event production company called CAPA Productions, founded by ANMP and DSRA board member Bret Matheny, is attempting to produce an event that may very well accomplish many of these goals. This ambition venture will definitely be more than just a few MLM gurus giving lectures (not that that’s a bad thing). I’d give you more details about exactly what it will be, except much of that is being left up to you! Anyone who takes the survey gets a chance to win an 8 Gig Nano iPod ($150 value). Also, the MLM Industry Trends data has been updated HERE. An index of the ten largest public MLM companies is still outperforming the S&P 500 over the past year (20.02% to 11.5%) and past three months (9.88% to 8.71%), and the ratio of pro/con MLM search term results increased 1.8% to 2.09 (the third increase in the past four months, although the overall trend for the year is slightly down). 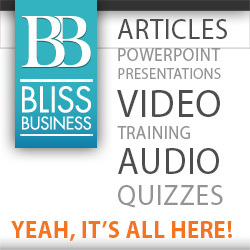 In closing, look for an increase in the number of Alerts and “Inside Network Marketing” podcasts in the weeks ahead. I’ve had some major projects that have kept me busy the last few months, but it’s time to get back in the game. Thanks for hanging in with me during my absence. At the beginning of every month the Industry Trends page at MarketWaveInc.com is updated HERE. As most of you already know due to previous commentary, I’m not a big fan of using a specific company’s web traffic as an indicator of a growth or decline in popularity. However, the number of people searching for information about a company, or any aspect of network marketing in general, is a good indicator of rising or falling interest in the business model, and public opinion of it. It would appear that there is a gradual, and strange, lessening of interest in home business ventures entirely. What’s most bewildering is that the sharpest decline in Google searched for the term “home business” began during the sharpest decline in the economy. Did you notice the other interesting trend in the above graph? Searches for “home business” was always at its annual lowest during December, and always spiked in January. 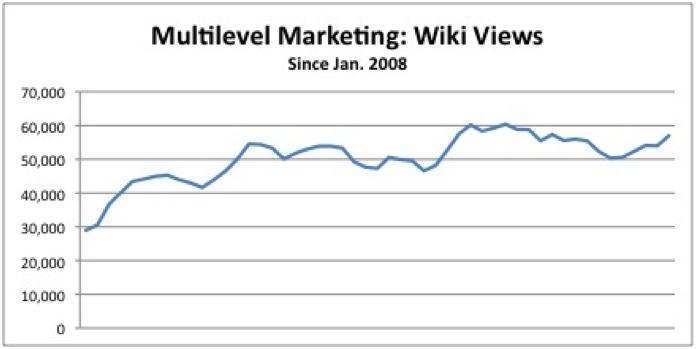 The bad news is that back around late 2008 the Wikipedia page devoted to Multilevel Marketing ceased to be neutral. It is now controlled by a clique of Wiki editors who are demonstrably anti-MLM. 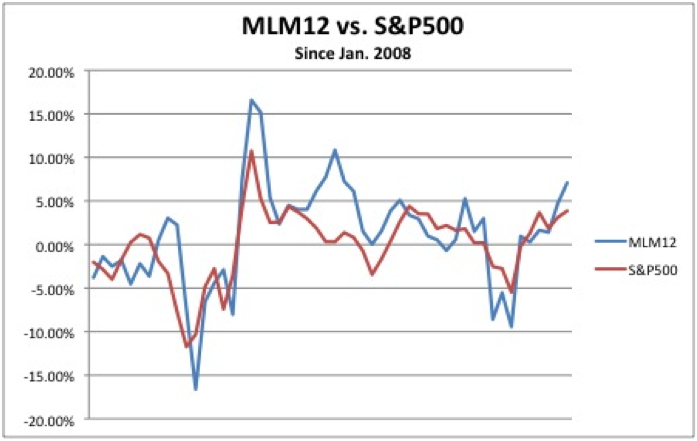 The MLM12 has outperformed the overall market in six of the last eight months (and 22 of the last 36). In March the S&P grew by 12.0%. The MLM12 grew by 19.8%. Over the past 12 months the S&P has risen 5.7%. The MLM12 has grown 23.6%. EpicNetwork.com domain name for sale. I have received an inquiry regarding the purchase of this domain name, which was originally used for my ill-fated attempt to launch my own network marketing company back in 2005 (yes, I’m 0-for-2 in my corporate ventures, but hey, I’m 2-and-0 in court against my ex-partners!). Before selling this domain I thought I’d give my subscribers a shot at it first. This will also help me appraise its value. The average provided by five different free appraisal services peg the value at $3,621.50, however the range is from $17,002.50 down to only $170.00. That doesn’t give me a lot of confidence in free appraisal services. I paid GoDaddy to perform a formal, detailed appraisal and they came up with $623.00. However, within GoDaddy’s domain name auction site bidding for CoreNetwork.com is up to $70,000 and IntercomNetworks.net is going for $50,000. Wouldn’t EpicNetwork.com – with fewer characters, no plural, and .com instead of the much less valuable .net – be worth more than that? Surely it’s worth more than the hyphenated Clan-Networks.com, which has a high bid of $10,000! If EpicMeals.com and CheckOutNetwork.com are both going for $1,000, EpicNetwork.com has got to be worth several times that amount – right? Please tell me what you think. If you would like to purchase this domain name, make an offer. Either way, what do you think it’s worth? Thanks for your help. I don’t like binary plans. Fortunately, binary plans are almost non-existent today. The binary/unilevel hybrid plan, however, has become one of the most popular compensation plan models of the last two decades. The unilevel aspect is usually the matching bonus. Some call this plan the “binary match”. The matching bonus was first adapted to a binary plan in September of 1995 and has since become the most copied comp plan feature in history (although at the current rate the “break even bonus” may someday overtake it). The binary/match was invented by Jim Song who was the founder of Longevity Network (where I was a top earner from 1995 through 2003, and am no longer associated with). In fact, next time you’re in Vegas I can take you to a business park at the end of Sunset Blvd. and we can peer through the window of one of the ground floor offices and see the exact spot where the binary/match was invented (then flee from the building’s security). It should be an M.L.M. historical landmark. What’s unfortunate is that a number of industry leaders, both field and corporate, have recently felt compelled to bash the binary based on bogus b… binformation (look it up). I have no problem with anyone making a pragmatic, historically, logically, mathematically, fact based argument against a specific style of plan. I did it several years ago when I made a case for why the Compressed Unilevel was not as good as was being declared. I even made a case for why the Aussie 2-Up should be avoided unconditionally. I did that because, I felt, and still feel, there was no redeeming aspect to it and it’s flaws, unlike the straight binary, were inherent and irreparable. Trying to fix the Aussie 2-Up would be tantamount to teaching Jeffrey Dahmer better table manners. But to denounce an entire category of plan, one where there are myriad variations, most of which have, in fact, resolved most of the flaws in the original concept (circa 1989), is just silly on it’s face. Saying the Binary plan is “bad for network marketing” (actual quote), is like saying, “Fords are bad for automobiles”. But, alas, they have done just that. In this case, “they” being John Godzich, Jeff Olson, Blake Mallen, and to a lessor extend, Lou Abbott and John Councel. And for the record, this is not meant to defend or promote any particular company (there are hundreds of binary programs out there), and I am by no means discrediting the unilevel plans used by anyone listed above. I like unilevel plans, and the plans they promote are just fine. My only issue with them is the statements they have made against binary plans. Over the last several months I have received more requests for commentary on Zeek Rewards than probably every other M.L.M. opportunity combined. Because I haven’t commented publicly, at all, I’m now starting to get emails accusing me of accepting “hush money” to keep silent. No, that’s not the case. I will never comment publicly on any person, company or product until I have exhausted all efforts to get my facts straight, which includes having the subject respond to my questions and/or concerns. Usually this isn’t a challenge. Unfortunately, how this sometimes goes is that the company chooses to not participate in my inquiry, even after I practically beg them to respond to my concerns. Sometimes they say I’m just not “relevant” enough, or words to that effect, but usually they just ignore me. I then go with what I have and make negative comments about them, and then suddenly I become relevant enough to have their attorney write me a nasty letter telling me to “get your facts straight”, and demanding a retraction. The letter never includes any specific points I got wrong, so I then write back asking for such clarification, and never hear from them again. (this is, by the way, exactly what happened with my PrePaid Legal exposÃ© in 2002 – which, for the record, is no longer relevant). In the case of Zeek Rewards, I’ve been informed that late July is the earliest anyone from corporate can speak with me. I know they are in a state of overwhelm right now, which is why I’ve been patient for weeks. But, over those same weeks they seem to have no problem finding time to be interviewed by other bloggers and broadcasters. I guess I’m not as relevant. At least until my next show, when I go with what I’ve got. I’m not really sure why ZR can’t find time to be interviewed by me, but I’ve got some insiders lobbying on my behalf, and ZR management has never shied away from public inquiry before, so I’m still hopeful the next INM show you hear will be a live interview. Only this time the interviewer won’t be lobbing underhanded softballs and blowing love kisses.